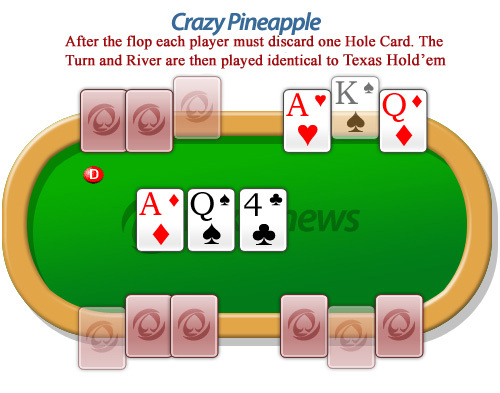 Crazy Pineapple is an exciting variation of Texas Hold'em poker. The biggest difference between the two games is: every player receives 3 Hole Cards, of which one has to be discarded after the flop. 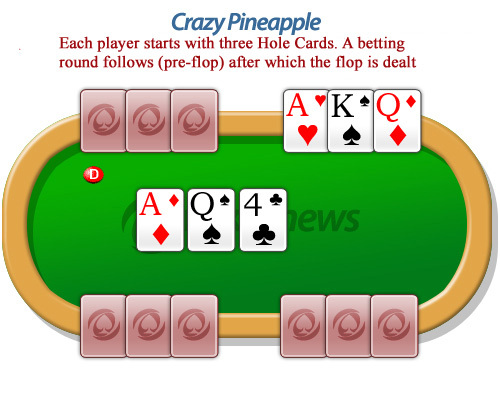 In Crazy Pineapple, every player starts off with three Hole Cards that are dealt face-down. After the first betting round, the dealer will uncover three Community Cards (the Flop). During the second betting round, every player has to discard one of their Hole Cards. The dealer now reveals a fourth Community Card (the Turn). Another betting round follows, after which the dealer will deal the last Community Card (the River). A final betting round follows, after which the remaining players go to a showdown. Just like in Texas Hold'em, players have the choice to use both of their Hole Cards and three Community Cards, one Hole Card and four Community Cards or all five Community Cards and none of their Hole Cards. In Total, there are four betting rounds in Crazy Pineapple. Every bet and raise during the first two rounds can only be the amount of the small blind. In the last two rounds the bets double to the amount of the big blind. The maximum amount of bets per betting round per player is four. This would consist of (1) a bet, (2) a raise, (3) a re-raise and (4) a cap. The word cap is used to describe the third raise within one betting round. The betting is now capped and players only have the option to call or fold. Home to the biggest tournaments online, these rooms also have the largest player base great bonuses, tons of action and best software. If you don't have accounts here, you are missing out on the best that online poker has to offer.